+2.5 | Ex-Steelers kicker was top active athlete (third) at Tahoe's American Century Championship in July. +1.9 | Bespectacled reliever (blue frames for Mets) wears glasses for golf, too. +1.6 | Carolina Hurricanes defenseman played high school golf. +1.2 | As documented on YouTube, Falcons QB is more proficient in charity golf than singing "Sweet Caroline." +0.6 | Panthers backup QB plays at Whisper Rock in Scottsdale. +0.6 Islanders RW loves Pebble but plays more at Lookout Point in Ontario. +0.4 | Sharks center hosts an event to support youth hockey. +0.4 | Bills Pro Bowl DT, who played at LSU, belongs to Squire Creek in Louisiana. 0 | Eagles QB and 2008 Heisman winner has a highly touted golf game but says he can't guesstimate an accurate handicap. 0 | Titans kicker paired with No. 1 Scobee in a match versus the trick-shot Bryan Bros.
0.3 | Brewers pitcher went head-to-head against Jason Dufner at team's ballpark. 1 | Capitals LW captained team in 2014 NHL Players' Association fundraiser at Pebble Beach. 1.1 | A's pitcher excelled at baseball, golf and tennis as a kid in South Florida. 1.2 | NBA's MVP shot a two-under-par 70 at Pebble Beach this year. 1.3 | Won Stanley Cup with Kings before joining Capitals. 1.6 | Earthquakes forward/winger is Harvard soccer's fourth all-time leading scorer. 1.6 | Liberty star, a junior-golf standout, appeared in an ad with Tiger Woods. 1.9 | Basketball great hasn't posted a score at Chicago or Florida clubs since 2013, but computer says he's a 1.9. 2.2 | As a Brave, Phillies RF played at Isleworth with Tom Glavine, John Smoltz and Tiger Woods. 2.2 | Twins switch-hitting CF has made five holes-in-one, all right-handed. 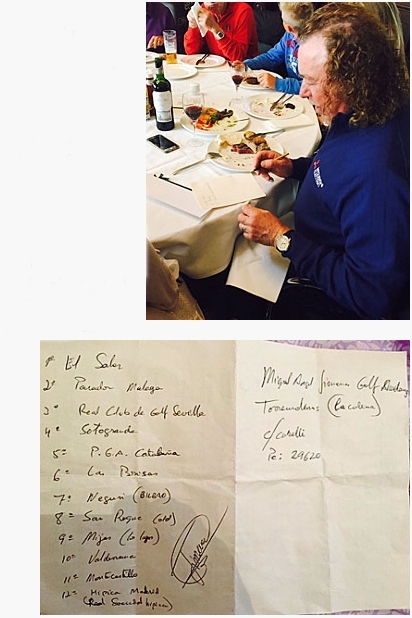 2.6 | Tennis great has partnered with Jose Maria Olazabal in a charity event. 3 | QB's injuries and commitment to Cowboys have meant fewer rounds for the previous No. 1 golfer in this Golf Digest ranking. 3 | Surfer has a foundation that supports social and environmental causes. 3.9 | Cardinals pitcher started a fantasy football league for charity. 4.0 | Broncos QB has helped many through his PeyBack Foundation. 4.0 | Mavs guard established Point of Hope Foundation with emphasis on autism after his son was diagnosed. 4 | Blue Jays All-Star 3B once hit a 300-plus-yard drive on Golf Channel's "Morning Drive." 4 | Islanders RW says his favorite course is Jupiter Hills in Florida. 4 | Romo's backup in Dallas was a pro baseball player before playing quarterback at Oklahoma State. T-30) PATRICK PETERSON 4.1 | Cardinals star is second-highest-paid CB in NFL; has hosted a charity golf event. 4.1 | Tigers pitcher has put more than $1 million into his Victory for Veterans programs. 4.2 | Ducks captain hosts an event for Duchenne muscular-dystrophy research. 4.3 | Packers kicker donates time to The Locker, a kids' program in his hometown. 4.5 | Tigers 2B began his charitable work with Kinsler's Kids Reading Clubs. 4.7 | Star of 2014 U.S. Olympic team and Capitals RW supports March of Dimes. 5 | Nationals outfielder had a monster season in 2015. 5 | Seahawks kicker has been dubbed Hausch Money by coach Pete Carroll. 5.2 | NASCAR driver learned golf from his dad, says chipping is his strength. 5.5 | Packers QB has improved his golf game during 11 seasons in Green Bay. 5.8 | Chiefs QB's foundation puts foster kids through San Diego State. 6 | Giants pitcher hit 340-yard drive in 2012 AT&T at Pebble. 6 | Angels 1B's foundation helps kids in the Dominican Republic and families and kids with Down syndrome. 6 | Lightning center is often on course for charities in Tampa and at home in Ontario. 6.2 | Two-time Olympic beach-volleyball player. 6.5 | Indy driver funds childhood-cancer research through his foundation. 7 | Grizzlies point guard won NBA Sportsmanship Award. T-46) GERALD HENDERSON JR. 7 | Blazers G grew up on a course and was an all-conference golfer in high school. T-46) SHELBY MILLER 7 | Braves right-hander was the team's only 2015 All-Star. 7 | Steelers QB says Titleist's David Southworth "and the guys in the tour trailer take great care of me." 7 | Cavs G hosts annual event for his foundation and opened J.R. Smith Learning Center of The First Tee in New Jersey. 7 | Lions QB has given more than $1 million to a Detroit rec center that combines academic support and sports. 7.9 | Yankees star plays in charity events, including one in July at Trump Ferry Point. 8 | Pats QB gets eight shots in the AT&T National Pro-Am at Pebble Beach. 8 | Hawks All-Star's foundation helps inner-city kids; learned golf from his grandfathers: "One played a big hook and the other a big slice, and I've played both." 8 | Video of Rays 3B on the range is on YouTube. 8 | Browns QB has skill but not time to get closer to scratch. T-53) ERIC RUPE 8 | Forty-year veteran of BMX. 8 | Surfer swam to help friend/competitor during shark attack. 8.2 | Penguins star supports lots of charity events. 8.4 | Red Wings captain plays at Birmingham (Mich.) C.C. 9 | Takes on Saints backups with "quarterback challenge" that includes version of golf. 9 | Skier once hit an errant drive that hit his wife in the eye. 9.3 | UFC middleweight fights for the title Dec. 12; plays near his home in Santa Cruz, Calif.
10 | Rangers LW plays at Oviinbyrd in Ontario. 10 | Hockey great often follows PGA Tour rounds of Dustin Johnson, father of grandson Tatum. 10 | Saints RB and 2009 Heisman winner helps kids who have incarcerated parents. 10 | Now with Nuggets, was enticed to join Grizzlies by fellow golfer Mike Conley. 10.3 | New York Observer named Giants QB one of its top-20 philanthropists under 40. 10.3 | New Clipper established foundation in 2002 to help kids adopt healthy habits. 10.3 | Yankees 1B has given $1 million to Harlem RBI. 10.9 | Chargers QB helps foster kids behind the scenes. 11 | Speedskater broke 80 at Old Mill in Salt Lake City. 11 | Twins 1B and future Hall of Famer is known for going out of his way for fans. 11 | Dodgers 2B works to end animal cruelty. 12 | Chicago Sky star led the WNBA in scoring and enjoys golf "one-on-one time" with her father. 12 | White Sox pitcher played football (wide receiver) and baseball at Notre Dame. 12 | Islanders center hosts sick and underprivileged kids at home games. 12 | Warriors All-Star recently shot 84, says his dad, Mychal, former No. 1 pick in NBA draft. 12.1 | Panthers LB founded Homes For Wounded Warriors. 13 | Mets OF has been playing for less than two years. 13 | Rangers pitcher supports education in U.S. and Africa. 13 | Pro skateboarder has a foundation for kids and injured action-sports athletes. 13 | Angels All-Star CF has been an answer on "Jeopardy!" 14 | Giants All-Star, former Rookie of the Year and MVP is a popular addition to the AT&T at Pebble. 14.2 | Cardinals WR started to play golf in 2013 and belongs to five clubs. 15 | Jets WR and wife Jessie James provide service dogs for returning vets through Deckers Dogs. 15 | 2014 Formula One World Champion devotes time to children's charities. 15 | Motocross freestyler disparages his swing. 15 | Olympic champion refined his game under Hank Haney. 15.7 | NBA Finals MVP for Warriors is improving rapidly. 17 | Blackhawks captain has hosted a golf benefit for kids. 18 | Seahawk with incredible Super Bowl reception supports Pacific Northwest charities. 18 | Minnesota Lynx star's husband, Ben, is a former golf professional. 20 | Clippers star has played with Tiger Woods, Davis Love III and Bill Clinton and has established the CP3 Foundation. 22 | NASCAR'S 2014 Sprint Cup champion loves Augusta National and says golf is a "relief valve." 25 | NASCAR driver says his handicap was lower before his kids were born. 30 | Tennis player says she studies golf pros' games; made a hole-in-one in 2003 in Perth. 30 | Titans QB and 2014 Heisman winner got golf clubs from his parents as a graduation gift. 30 | Seahawks CB's videotaped match with his cousin included some verbal gamesmanship. 36 | World Cup defender practices at the Topgolf near her home in Virginia. ST. SIMONS ISLAND, Georgia — There were times when Davis Love III and Davis Love IV made it seem like any other round of golf they have played at Sea Island. On the opening hole at the Seaside course, the 21-year-old son hit wedge toward the flag and his father pleaded, "Go!" until the ball settled about 10 feet below the hole. Love followed with a wedge of his own that landed just beyond the flag and stopped 5 feet away. "Good shot, Dad," the son said. Only this day was different. It was the opening round of the RSM Classic. It was the PGA Tour debut of Dru Love. And yes, there were plenty of nerves, only they belonged to his father. "I was a little flustered," Love said. "I was running late and nervous for him, and then he hit it right down the middle and hit it stiff and made birdie. And I stopped worrying about him and started worrying about me a little more." Now both of them need to worry about making the cut. Love, the tournament host, and Dru Love, a junior at Alabama, each wound up with an even-par 70 and were seven shots to par behind Kevin Kisner, who shot a 7-under 65 on the Plantation course. THE LEADER: Kisner hit 3-wood to 35 feet onto the fringe and made eagle on his penultimate hole to take a one-shot lead based on par. Jeff Overton, David Hearn and Tom Hoge each had a 6-under 64 on the Seaside course. Kevin Chappell, Kyle Stanley and Jim Herman had 6-under 66 on Plantation. Kisner has done everything but win this year. He has lost in a playoff three times — to Jim Furyk in the RBC Heritage at Hilton Head, to Rickie Fowler at The Players Championship and in a four-man playoff at The Greenbrier Classic. And then he was runner-up by two shots to Russell Knox in the HSBC Champions in Shanghai. Discouraged? Only slightly. In every case, the other player won instead of Kisner feeling as though he did something to lose. "I haven't been disappointed in any stretch of golf coming down the stretch to have a chance. 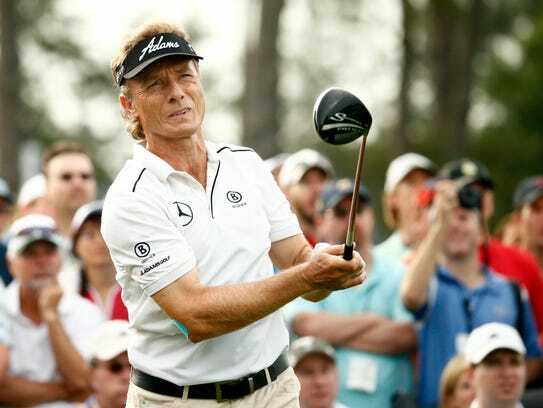 I always rate myself on that," Kisner said. "I've just gotten beaten a few times, so hopefully I'll have a chance coming down with a couple-shot lead on Sunday." HOME GAME: Davis Love III has lived at Sea Island since he was 13 and raised his family in the Golden Isles. Dru Love said he knew just about everyone in bleachers behind the first tee and following along the fairways. He has played these courses — Seaside and Plantation — more than any others in the world. That's a help. But it might have been a burden. Dru Love hit 3-wood off the tee to get it in play, and then a wedge to 10 feet for an opening birdie. "After I birdied the first hole, my expectations were a little high," he said. "I've played this course a lot and I've played it well. I thought I could play better than I did." He didn't make another birdie until reaching the green in two on the par-5 15th. FATHERS AND SONS: It is rare for fathers and sons to compete in the same PGA Tour event, but far from unprecedented. Craig Stadler and son Kevin played in the 2014 Masters. Jack Nicklaus decided to play his final full season in 2000 when son Gary earned a PGA Tour card. Jay Haas and son Bill played several times together because Bill Haas is a six-time tour winner. What made this different was that Love's son is still in college — and the tour tweaked the groupings so they could play together. THE COURSES: Love asked the PGA Tour to use two courses this year to expand the field to 156 players and make sure everyone who had a full PGA Tour card had a chance to play. The RSM Classic got that and more. Everyone from the Web.com Tour Finals got in, along with a long list of past champions that included Mark Hensby at No. 960 in the world. Hensby opened with a 68. The average score at Seaside was 68.6 for a par 70. The average score at Plantation was 69.8 for a par 72. THE CUT: The forecast was for stronger wind and slightly cooler weather, which could be an advantage for Love and son because the Seaside course they played in calm conditions Thursday is more exposed. Dru Love said his goal was to make the cut in his first PGA Tour event. And he had another goal. "Beat my dad," he said. "I didn't beat him today. Obviously, my goal is to make the cut. I've got that in the back of my head. I'll try to be more patient." It’s technology like this that makes me want to own an Apple Watch. Golf equipment manufacturer PING has launched the iPING app (free) for the watch that includes the Golf Workout ($5 in-app purchase) that’s engineered to capture and track fitness data, swing tempo and on-course statistics. Believe it or not, golf can be fantastic for your fitness. Yes, there are some apps already out for the watch and smartphones that kind of do the same thing. In my experience, however, many of them are invasive in that I constantly need to be pushing a button, synchronizing devices, double-checking to make sure my swing is being registered, and other tedious tasks that take away from the natural flow and enjoyment of my golf game. The PING app promises to eliminate a lot of that by working seamlessly with Apple’s fitness tracking system. This also isn’t PING’s first foray into Apple’s mobile devices: Five years ago, the company debuted a putting-improvement app for the iPhone that’s still popular today: Golfers simply snap a separately-sold iPING Cradle to their putter shaft and the app tells them everything they want to know (and some things they don’t) about their putting stroke. In this particular case, PING’s in-house app development team focused on bringing more visibility to golf’s health benefits by using key exercise metrics that were already being gathered from the Apple Watch. 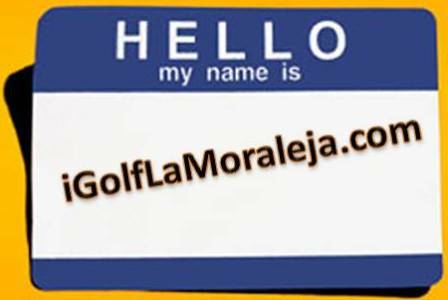 Golf Workout records heart rate, step count and calories burned — in both the practice or play modes. In practice mode, you can time your backswing and downswing, or measure your tempo. The play mode lets you track fairways hit, greens in regulation, putts per round, and your score. When PING first debuted the putting cradle, it was an instant hit with amateur golfers and professionals alike. Many of the latter began using it during putting lessons, to show students quantitative data about their putting stroke. It was a real eye opener. And I really believe that technology like the Golf Workout has a place in golf’s future — especially because of the game’s health benefits. Kudos to PING for bringing it to our wrists. Nov 18 (Reuters) - United States Ryder Cup captain Davis Love III on Wednesday appointed 14-times major winner Tiger Woods as one of his vice-captains for next year's Ryder Cup at Hazeltine National in Chaska, Minnesota. Woods, 39, is a veteran of seven Ryder Cups as a player, most recently in 2012 under Love's captaincy, and is battling to recover from a nagging back injury that led him to undergo two surgeries over the past two months. President Obama racked up quite a few frequent flier miles in 2015. 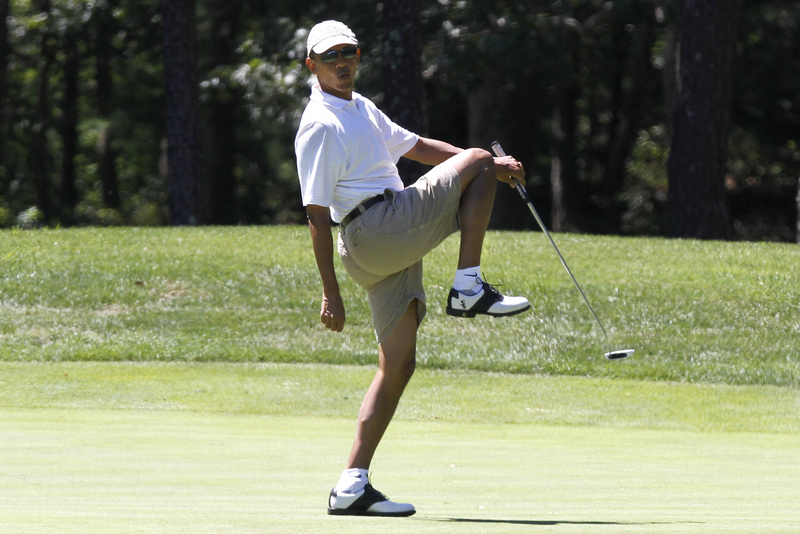 A Tuesday report from Judicial Watch claims that Obama took three “unnecessary” golf and family vacations this past year, and American taxpayers footed the bill. According to the new information, the travels to just Palm Springs in June, New York City in July and Martha’s Vineyard in August cost a cool $3,115,688.70. No se supone que el resultado en el deporte sea siempre justo. Que lo cuente si no Dustin Johnson, quien recibió un castigo absolutamente inesperado para su buena puntería, cuando peleaba el título en el World Golf Championship de Shanghai. Johnson lanzó su tercer tiro en el hoyo 8 del torneo desde el fairway y la pelota tenía una dirección muy precisa hacia la bandera. Tanto que rebotó justo contra ella, con consecuencias lamentables para el ejecutante: la pelota rodó con fuerza por el green, siguió su recorrido y terminó en el agua. Así, lo que muy probablemente era un birdie para Johnson terminó en un doble bogey. Como el estadounidense terminó el torneo quinto con 17 golpes bajo el par, a sólo tres del campeón, el escocés Russell Knox, las cuentas arrojan que una historia diferente en el fatídico hoyo 8 podría hasta haber terminado con su consagración. Aunque la lógica -y esto lo sabe Johnson, no siempre pueda aplicarse. CEDARBURG -- Golf is commonly known as the "gentleman's sport," while soccer can be seen as the "hooligan's sport." Mix them together, and you get an interesting new sport -- foot golf. The U8 Fusion Academy soccer team wrapped up their fall season with a fun and unusual get together. "The kids worked hard this year. It's just nice to have something fun," said Jake Hatzenbuhler, U8 Fusion Academy soccer coach. That 'something fun' is foot golf! The sport is somewhat new to the United States, but it is growing in popularity. "It's really nice because it's an activity that anybody can do," said Kurt Baehmann, Baehmann's Golf Center director of operations. The game combines aspects of golf and soccer -- so players follow golf rules, but instead of a golf ball -- a soccer ball is used. And there are no golf clubs -- only a player's foot. "You start in the tee box just like you do with regular golf -- in between the tee marks, kick down the fairway," said Baehmann. The goal is to use the fewest amount of kicks to get the ball into the hole. "Golf is a lot more difficult. It takes a lot more patience. Soccer golf is just fun. I mean, you can come out here and spend an hour or two and play a round for, you know, nine or 18 holes and just enjoy it," said Hatzenbuhler. For Kurt Baehmann, the sport is ideal for almost anyone. "We get full families. You'll get people in the 20s and 30s that come out and they'll have a few beers. We had a group of people in their 80s that come out that instead of -- they would normally get together every week and go for a walk in the park, but now they decided, 'let's try this foot golf thing.' You don't have to have a full team of people. You don't have to be in amazing physical condition. As long as you can kick a ball you can play," said Baehmann. It's an inclusive activity that fits in perfectly for the Baehmann's Golf Center. The center has been part of the Cedarburg community for 55 years. "My dad started it with my grandparents in 1960," said Baehmann. Over time, as the economy has changed, what was once only a golf shop has evolved as well. "I can hope all I want that golf is this amazingly growth sport but, you know, we're going to do what we can -- but we also have to come up with other options for people to do and we really want to become an entertainment facility," said Baehmann. That's evident by the way some families enjoy Baehmann's Golf Center. "Because the holes are right next to the golf greens, we've had groups of parents and kids where the parents will play regular golf, the kids will play foot golf and they'll play together in the same foursome," said Baehmann. Whether it's a simple foursome, or a soccer team celebrating another season, foot golf is quickly becoming a household sport and bringing friends and families together. "That's ultimately what we're all about, is really trying to create a place for people to get outdoors, get off the couch, get away from the TV and playing video games -- get out there, breathe some fresh air and have fun with people and socialize," said Baehmann. Believe it or not, there is a pro tour for foot golf. Baehmann believes in the next few years, it will be popular enough for those professionals to make enough money touring to call it a career. Joana Sanz, novia de Dani Alves, se convirtió en una de las protagonistas del desfile organizado este miércoles en Madrid por la conocida marca de lencería Women'secret. La modelo canaria lució varios sensuales conjuntos, pero llamó especialmente la atención uno con sujetador transparente que dejaba ver sus pechos... si no fuera porque utilizó pezoneras. Joana completaba el atuendo con unas medias negras, un cinturón con cadenas y, para completar el atrevido look, lucía melena suelta, pendientes largos y botines de piel negra con hebillas y considerable tacón. De medidas casi perfectas (90-60-91) y una estatura de 1,80 metros, Joana Sanz (22 años) ha desfilado para grandes firmas como Gucci, Rosa Clará, Andrés Sardá, Desigual, Torreta o Jimmy Choo. Comenzó a salir con el polémico Alves hace apenas unos meses, poco antes del verano, pero ambos han exhibido su amor en sus respectivas cuentas de redes sociales. Former Boston TV sportscaster Bob Lobel has sued a Newton golf club, claiming it discriminated against him by refusing to allow him to use a specialized golf cart in its bunkers or on its greens — and his attorney says there may be other suits coming for courses that won’t cater to disabled golfers. Lobel, who said that he is disabled and needs a specialized golf cart known as a SoloRider or ParaGolfer, sued the Woodland Golf Club of Auburndale in federal court for $250,000 for unlawful discrimination and violation of his civil rights, according to the suit. “As a direct and proximate result of Woodland’s unlawful discrimination, (Lobel) has sustained injuries and damages including the right to socialize with longtime friends, feelings of isolation and depression,” Michael Longo, another attorney for Lobel, wrote in the complaint. Lobel said he has been frustrated by the whole process. The suit alleges that a Woodland member told Lobel the specialized carts would not be allowed on the greens or in the bunkers. He attempted to put Woodland in contact with other golf clubs that allow the carts, but it “continued in its refusal,” according to the suit. Woodland, however, indicated that it disallowed the carts for Lobel’s protection. “Mr. Lobel requested access to Woodland’s golf course with a special golf cart. Out of an abundance of caution, we agreed to permit use of the special cart in areas of the course other than sand traps, based upon concerns for Mr. Lobel’s safety,” David Garfinkle, general manager of the course, said in a prepared statement. The elder gentlemen of professional golf are getting a facelift. The PGA Tour’s Champions Tour announced Wednesday major revisions to its year-end schedule for the upcoming 2016 season. Following in the steps of the Tour’s FedExCup Playoffs and the Web.com Tour’s Finals, the Champions Tour – for players 50 and older – will have playoffs. The inaugural Charles Schwab Cup Playoffs will feature three tournaments culminating with the season-ending Charles Schwab Cup Championship to determine the champion. The 2016 season includes 26 events with total prize money exceeding $55 million. The Charles Schwab Cup winner will earn a $1 million bonus and the top five finishers will also receive bonus payouts. Two of the three events in the playoffs are new tournaments. On Monday, the Tour announced the addition of the PowerShares QQQ Championship. It will be held in the Los Angeles area Oct. 24-30 and serve as the beginning of the playoffs. The site for the 2016 event is yet to be determined. Sherwood Country Club in Thousand Oaks will host the tournament in 2017 and 2018. The second new tournament is the second event of the playoffs – the Dominion Charity Classic on the James River Course of Richmond’s Country Club of Virginia from Oct. 31-Nov. 6. The Charles Schwab Cup Championship, the traditional season-ending event at Desert Mountain Club in Scottsdale, Ariz., is the final event of the playoffs from Nov. 7-13. The Tour also announced a third new event – the American Family Insurance Championship in Madison, Wis. The tournament will be hosted by Steve Stricker, a Wisconsin native who will become eligible to compete on the Champions Tour in 2017. The top 72 players on the money list following the conclusion of the SAS Championship will head to the playoffs. And the SAS Championship will feature the inaugural Wildcard Weekend. One player who finishes in the top 10 of the SAS Championship but outside the top 72 on the money list will advance to the playoffs. A cut to the top 54 players on the money list will be made heading to the second playoff event. The final will feature the top 36. Points will be reset for the season-finale, allowing for all 36 players to have a mathematical chance of winning the Cup. The Tour also announced three historic venues will host major championships in 2016. Scioto Country Club in Columbus, Ohio, where Jack Nicklaus grew up playing the game, hosts the U.S. Senior Open. Carnoustie Golf Club in Scotland, where Ben Hogan won the only British Open he played in 1953, hosts the Senior Open Championship. And the Philadelphia Cricket Club, the oldest country club in the U.S., hosts the Constellation Senior Players Championship. The Senior PGA Championship returns to The Golf Club at Harbor Shores in Benton Harbor, Mich., which previously hosted the tournament in 2012 and 2014. The other major, the Regions Tradition, will be played at Greystone Golf & Country Club in Birmingham, Ala. Golf is sort of tiring right now. The year that won't end is kind of, sort of, almost ending. There are a few more PGA Tour events, the Race to Dubai and Tiger Woods' event in December, and that's pretty much it. What that means is that the 2016 year will be starting very, very soon. I'm already looking ahead to what's going to unfold. I have a few questions, too, about the tournaments, the players and the equipment. Let's jump right in. 1. 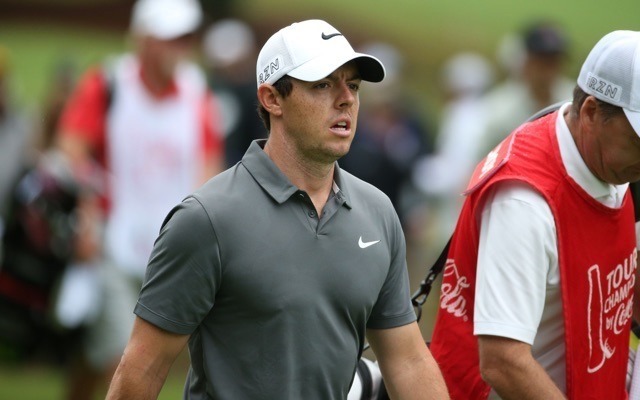 Can Rory McIlroy fix his broken putting stroke? This might be the biggest question I have for 2016 because it seems like it affects the most things. If he fixes it, lights out, kids. Daddy is home. If not, he'll still win tournaments, but he won't be elite. 2. Will golf's governing bodies explore a neutralization of distance? You can do a lot of things. Pull back the clubs. Pull back the ball. Move to new courses. When Bubba Watson and Jason Day are purposefully banging their drives off tents because they don't care about hitting fairways, that's an issue. Will golf do anything about it? 3. Can Rickie Fowler make "the leap"? I don't think Fowler is capable of joining the triumvirate of McIlroy, Day and Jordan Spieth. If anyone is going to do it, however, it's going to be Fowler. 4. Who is this year's Justin Thomas? Thomas became a borderline star in 2015, concluding with his win at the CIMB Classic. Smart money here is on Patrick Rodgers. 5. Can Thomas (or someone like him) shake up the Ryder Cup team? Tony Finau and Billy Horschel are also potential candidates here to mix it up with the old guard and lead an American charge at Hazeltine that is much needed. 6. Who gets their first major? In the last two years, only Jordan Spieth and Jason Day have been first-time major winners (and those two hardly play the part). Will 2016 produce a more 2013-like slate of winners? That year, Justin Rose, Jason Dufner and Adam Scott took home titles. Recent history says no, but it would be pretty cool if guys like Fowler, Hunter Mahan, Brandt Snedeker or Bill Haas could get No. 1. 7. When does Tiger Woods return (if at all)? This is a big one whether you want it to be or not. Woods still moves the needle. Woods will always move the needle. Think about it, Jack Nicklaus still moves the needle and he hasn't played in a major in nearly two decades. Tiger will take his time getting back to competitive tournament play which is a good thing. I'm simply curious about when he'll return. 8. What does Phil Mickelson have left in the tank? Lefty switched coaches late in 2015 as he prepares for one last gasp at a major or two over the next few years. That sun is fading pretty hard, though, and Mickelson hasn't won since the 2013 British Open. It would be both sad and fitting if that was his last tournament win. Temperatures continue to drop and on Wednesday afternoon, the weather wasn't the most inviting for disc golf enthusiasts at the new course. Yes, that's right. A new disc golf -- folf -- course is ready for use right across the street from the High Sierra Dog Park in the Billings Heights. The once dream, turned reality experienced a long road to opening as the project to open a folf course began more than five years ago when the idea was spawned in a Skyview High School class. It's now the third course in Billings as Phipps Park (known as Diamond X) and Pioneer Park see tens of thousands of rounds played each year. More than $50,000 later, the "soft opening" of the course means there is a few more pieces to put together before Billings Parks & Rec Department dedicates the course. It plans to add a Q-Code to scan to your phone, providing a map to the 18-hole course. Parks Director Mike Whitaker said the department will erect a kiosk for players at the entrance. The dedication will take place sometime next month. As any avid golfer knows, there is nothing better than walking towards that first tee on a crisp but sunny morning. Gone is the hustle and bustle of the working week -- it's just you and a couple friends out for a relaxing round of 18. Sure, we all dream about teeing off on the Old Course at St. Andrews or casually strolling around Augusta National. But for us mere mortals who may not get the chance, we've come up with the next best thing -- the ultimate golf course bucket list. Over the last two weeks, we've been wading through hundreds of your recommendations and teaming up with some of the most influential golf Instagrammers around -- @beautifulgolfcourses, @anything_golf, @golf.addicts -- to find the world's must-play courses. 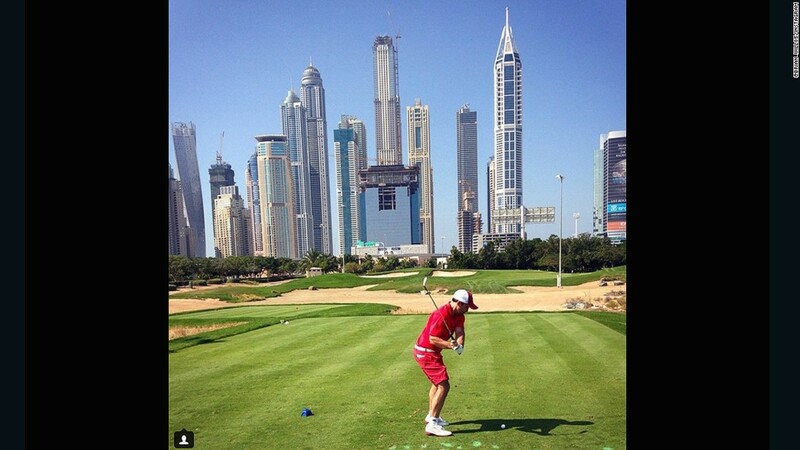 So whether it's teeing off into the sun, avoiding goats with your approach to the green or driving towards some of the tallest buildings in the world, take a look at these incredible courses and see how many you can tick off your list. Channing Benjamin, a 44-year-old general manager for Worldwide Golf Shops, treated us to this snap of this pristine, glass-like lake at the Arnold Palmer Private Course, California. "Golf is my life," Benjamin says. "Not only am I a huge fan of the game, but I changed careers to be more a part of it! "Photography is equally important to me and has become more than a hobby. I shot this particular image with an Android phone while waiting to tee off during a recent game. Cell phone cameras are just amazing these days!" Sin ánimo de ofender, simplemente a modo de mero dato informativo,todo español que no haya visto las tetas de una chica vestida con una camiseta del Athletic de Bilbao corre serio riesgo de ser un asocial. O, como mal menor, es un singular ciudadano que no ha sucumbido a las nuevas teconologías y carece de teléfono móvil inteligente y/o de WhatsApp. El pasado día 31 de octubre 2015, tuvo lugar un torneo de golf organizado por el Club de Campo Tres Cantos Golf. Primera Edición del trofeo Valentín Barrios, celebrado en el precioso campo de La Faisanera Golf. 86 jugadores participaron en el evento deportivo, torneo bajo la modalidad individual stableford. Torneo muy especial, pues al margen de lo deportivo, que fue todo un éxito, lo más importante fue la emotividad del torneo. Valentín Barrios estuvo presente en el torneo e hizo entrega del premio especial VALENTÍN BARRIOS a la flamante ganadora absoluta, Virginia Delgado, con un resultado de 43 puntos stableford. Todos tuvieron la oportunidad de conocer y departir con uno de los mayores precursores y pioneros del golf español con la consiguiente satisfacción de los participantes que tuvieron la oportunidad de disfrutar escuchando sus anécdotas vividas a lo largo de su larga y exitosa carrera deportiva. Valentín Barrios ha sido una de las grandes figuras del golf español, miembro de la llamada “Armada Invencible Española”, con títulos como el Open de Madrid, el Open de España, el Open B.P. Olgiata (Roma), el Open de Akuasenta (Roma), el Open de Bérgamo (Italia) o el Open del Algarbe (Portugal) entre otros muchos. Además, ha sido dos veces ganador del Orden de Mérito continental, ha representado a España en la Copa del Mundo en tres ocasiones y ha sido galardonado con la Medalla al Mérito en Golf. Después de retirarse de la competición, Valentín Barrios ha dedicado su vida al golf, ejerciendo como Maestro en el Club de la Moraleja durante más de 35 años, compartiendo sus conocimientos con miles de alumnos y profesionales. Igual de grande que su palmarés, es su valor como persona, pues quienes tenemos la oportunidad de conocerle, os aseguramos que es tan grande o más si cabe como ser humano que como deportista. Valentín recibió el presente año, el Premio Ciudad de Tres Cantos 2015 por su brillante carrera deportiva. Después del torneo, se celebró una comida entre parte de los jugadores participantes en el torneo, Valentín Barrios y Gonzalo Ruiz de la Torre, Gerente del Club de Golf La Faisanera. En definitiva, fantástico evento deportivo a la vez que emotivo pues para Valentín Barrios fue un acto entrañable que le llenó de emoción. El Club de Campo Tres Cantos Golf, se siente muy orgulloso de su Presidente de Honor Valentín Barrios y satisfecho por la creación de la primera Edición de este torneo. Nunca nos cansaremos de reconocer los méritos de este enorme jugador, como también de tantos otros que pusieron la primera piedra en el golf español para que haya llegado a alcanzar el nivel que hoy tiene en España. WELLINGTON, New Zealand — Tiger Woods’ former caddie Steve Williams has described his anger and frustration at being “hung out to dry” by Woods’ management when the golfer’s infidelities were revealed in 2009, and says he was sometimes treated as a “slave” on the course. A New Zealand newspaper on Sunday published a chapter of Williams’ tell-all book “Out of the Rough” in which the New Zealand-born caddie describes his reaction on learning of Woods’ extramarital affairs. Williams writes that he didn’t hear from his close friend Woods for four months as the golfer’s marriage, career and reputation fell apart. Williams says his life became “absolutely miserable” as details of Woods’ behavior emerged and people suspected he had been aware of, or event played some part in Woods’ affairs. “People in my local community would front up to me at the shops and call me a liar to my face, and ask ‘what are you doing with him? '” Williams wrote. “I repeatedly asked for Tiger’s management to release a statement that would clear me of any involvement in this lurid news. “Tiger finally rang me on March 23 (2010). He had already sent me an apologetic email when he was in rehab. It was heartfelt and meaningful; he was open, honest and remorseful and it reinforced my thinking that because I was so straight up and had such strong values, he felt he couldn’t tell me what was going on with his affairs.”Williams said that before resuming his 13-year association with Woods he met with the golfer and presented a list of demands. “I wanted him to prove to me he could change his behavior and show me — and the game of golf — more respect,” he said. 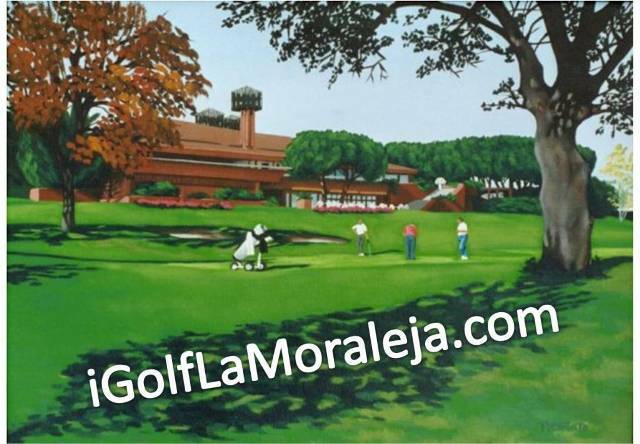 El golfista español, Miguel Ángel Jiménez era preguntado por miembros de la revista Top 100 Golf Courses para conocer su opinión sobre los campos españoles y sobre sus gustos. Como es lógico, en su elección no podía faltar Málaga, su tierra natal y lugar donde ganó el Open de Andalucía en el año 99, misma fecha en la que se impuso en el Volvo Masters de Montecastillo.